Most of our chickens are Marans, which are black and white speckledy ones and lay a very dark brown egg. We feed them layers pellets, but they could also be fed mixed corn, and they are free to roam and scratch up their own food too - insects, worms, greenery, and they love blackberry season! 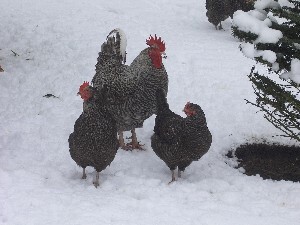 A chicken will lay eggs whether there is a cockerel around or not. If there is a male, then the eggs could be fertile, so if you incubated them you could get a chick hatch. If you collect all the eggs every day, you won't risk cracking open a boiled chick for breakfast! Chickens usually lay one egg a day, depending on daylight hours (and feed). We hatch out chicks using an incubator. You can use a torch called a candling lamp to check on the progress inside the egg. When they have hatched they are fed on chick crumb - ground up chicken pellets. They live in a special straw filled run in a shed to protect them from rats. We also had a bantam chicken, Fluffy, who was a Silky Cross. Actually, she was a bit of a mixture - she had some Silky in her (hence the fluffy legs). We did't know quite how old Fluffy was as she was donated to us, but she was at least 6 years old and she lived until May 2009. She occasionally laid a small light coloured egg, but her speciality was as a "broody". She used to sit on any eggs we gave her and she was an excellent mother. 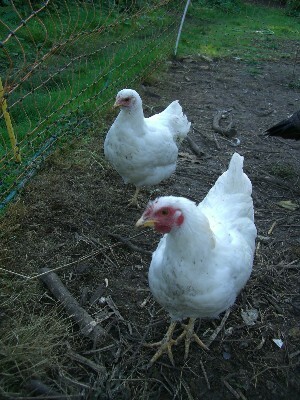 We now use the Wyandotte bantam as our "broody".